35mm engineered non-fire rated internal glazed door with clear toughened glass. Supplied in smooth black primer for on-site finishing. 10 years manufacturing guarantee. Ultra modern glazed interior door featuring slim vertical stile crossing with two horizontal rails and a small solid panel in between them. 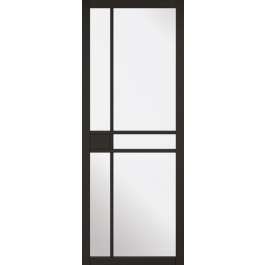 This door is available in a range of sizes and has a range matching of room dividers.